KOP Muay Thai Coach Lisa Edinger is making her pro debut as the first ever professional female Muay Thai fighter in Pennsylvania. She will be fighting another Pro with a 1-2 record and these fights are being held on Saturday January 28th at the Hamburg Field House. Lisa had no idea this is where her martial arts career wouldve taken her when she started training in the cardio kickboxing classes 5 years ago at Nak Muay Gym. Since then Lisa has graduated from student to KOP Muay Thai coach, where she teaches about 10 classes a week at Algeo MMA & Kickboxing. 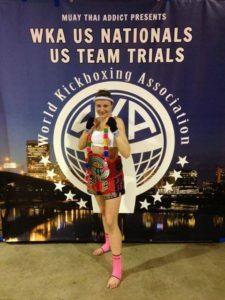 After taking the kickboxing class for a year she began her training in the muay thai program and progressed quickly, taking private lessons weekly with Coach Bill Algeo. Kru Eric Karner asked her if she ever considered fighting, in which she quickly responded no but would love to test her ability. She packed her bags and went to the WKA tournament in Virginia in which she won her first fight with a knockout and lost in the semi-finals. Since then, Lisa has amounted to a record of 10-2 as an amateur fighter with 2 consecutive National belt titles in the WKAs. KOP Muay Thai coach Lisa has also traveled to Thailand to train at the esteemed Sityodtong camp in Pattaya, Thailand. She is a full time martial artist, with KOP Muay Thai and BJJ, as well as a student teacher during the day. The doors to the Hamburg Field House open at 6 pm and we’re sure to hear a lot of supporters for the female bouts. The bell sounds at 7 and Lisa will be the 10th fight of the night. Here is an interview Lisa did with the USKA fight promotion. Please come and support the local KOP Muay Thai!